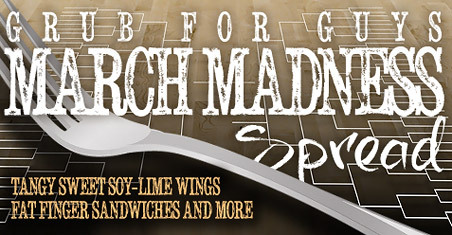 March Madness, like most big sporting events, has become a free-for-all of food options. But just because the Madison Avenue crowd tries to pump your eyes and ears full of pizza, tacos and subs, you don’t have to fill your belly with that commercially made food (and I use the word “food” loosely). So here are a few options to try and mix things up in your own kitchen, literally. I’ve been trying to create and perfect various wing recipes, and lately I’ve been into the sweet, tangy and spicy notes of Asian flavors, so here is the most ambitious of this group of recipes. Preheat oven to 400 degrees. Combine soy sauce, mirin, sake, sugar and ginger in a small bowl and whisk together. Set aside. Heat 2 Tbsp. oil in a large, deep skillet or Dutch oven on medium heat. Lay wings on a large platter or a few plates and sprinkle with salt and pepper. When you put your hand about 2 inches from the oil and can feel the heat, add half of the wings, skin side down. Sear for about four minutes per side and remove to another plate. Repeat with remaining oil, wings and salt/pepper, but after searing the second batch, return the rest of the wings to the pot, and dump in the sauce. Turn down the heat and cover, and simmer for about 10 minutes. Remove cover, and let simmer another five minutes, until sauce is reduced and thick. Using tongs, carefully remove wings to a large baking sheet coated with cooking spray and bake for about 15-20 minutes or until browned and crispy. 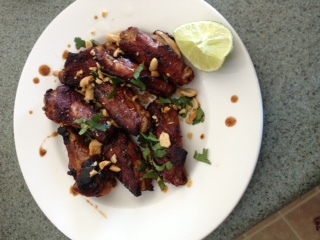 Remove wings to a plate, drizzle with some of the remaining sauce in the pan and Sriracha, and sprinkle with lime juice, peanuts and cilantro. People like tea-like finger sandwiches. They are also the food of choice for many fancy cocktail parties. But for dudes like us, they should be called something that reflects our caveman instincts, hence the name “fat finger sandwiches.” For the purpose of making this easy for you (and me), I’ll show you how to make about four sandwiches at a time, and you can multiply out as necessary. Is it even worth saying that this may be the single most delicious thing I have ever made or tasted? Because, well, it really was. And after wrestling with the idea that I would have to figure out how to butter the donuts, I realized that with the sugar glaze, the donut as “bread” would become crisp on its own. Heat a large nonstick skillet over medium heat and throw in a pat of butter. 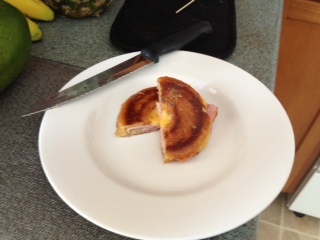 Slice each donut, lay a slice of ham and then cheese on the bottom and replace with the top, and then place donut sandwich in the skillet and press down with a spatula. Repeat with all donuts, and when bottom begins to brown (about 60 to 90 seconds), flip the sandwich over and cook for another 45 seconds to a minute. Move to a plate as is or slice in half or quarters. Another super easy and tasty snack. In a large nonstick skillet over medium heat, fry sausage slices on each side until brown and crispy, then drain on paper towels. Meanwhile, bake pizza bagels according to package directions. Let cool a few minutes, then put a few slices of sausage on four of the bagel halves and top with remaining bagel halves. I’ve been semi-obsessed with this classic combo lately, and this is about as simple as it gets. Bake chicken strips according to package directions and set aside. Meanwhile, combine syrup and hot sauce in a small bowel. Toast waffles and spread butter on each slice. 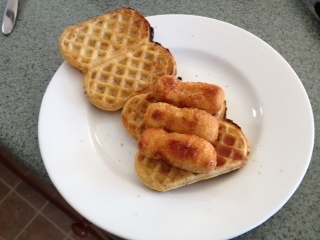 Then, top two waffles with chicken strips and drizzle with syrup. Top with other waffles (they should be those waffles that are perforated that you can break into four large finger sandwiches) and serve. Because you need some vegetables (well, maybe not! ), here is an easy and tasty way to put three food groups together. Wash and trim celery, leaving them as long “canoes.” Spread cheese on each and sprinkle with almonds. I imagine this would be a kickass hangover cure, although I haven’t tested that theory just yet. Combine all ingredients in a small juice glass and stir. Drink up! (Note: This makes one shooter, but you can use this guideline to make as many as you want). March Madness in Vegas – What could be better?